High Speed Technologies, Inc. provides expert repair and rebuild services for Blombach Spindles. 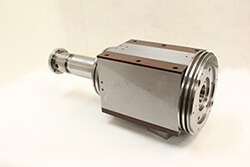 We can restore your spindle to OEM like new performance with a full warranty. We have 30+ years of experience repairing spindles. We find Blombach spindles used in rather specialty applications and they range a great deal in size. 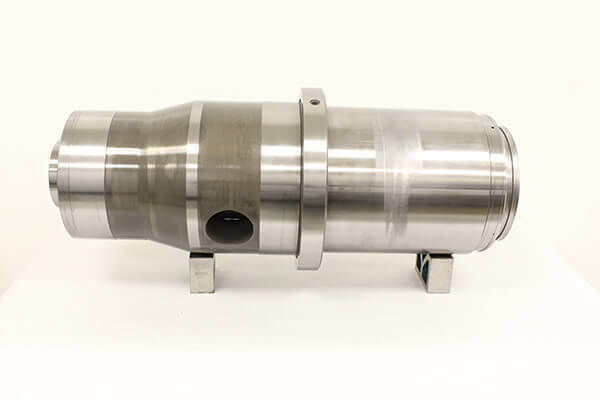 The spindles we receive are used in diverse functions from grinding and polishing processes to balancing drive shafts for the automotive industry. All of them are precision made with very high quality bearings. At HST we only use top name brand super precision spindle bearings for our repairs. Click here to see why HST should repair your spindle. We received the first Blombach of this style back in 2010. This spindle came in because the drawbar actuator wasn’t working properly. Although the shaft turned freely there was clear evidence that the preload had failed in some manner. We also got our first glimpse of what we would learn to be a reoccurring problem. The drawbar failed due to galling between two parts that had to slide over one another. Both parts were steel: steel on steel with no lubrication. This spindle was repaired and sent on its way. Job I-8302 failed due to the galling on the shaft where another steel part translated over the surface. The customer liked our repair and soon sent us another damaged spindle and we noticed the same failure mode. In fact we noticed the same failure mode on the next two spindles. At that our engineering team took a look at the problem and suggested certain design modifications. These were accepted by the customer and implemented. Since then we’ve repaired several dozen of our customer’s spindles. The results; a very happy customer. To see the design changes we made visit our Blombach Blog Page. Our customer sent us this large Blombach spindle before any serious damage occurred. It’s real good if you can take a spindle out of service at the first sign of trouble. It can save many thousands of dollars of journal restoration. But we know that many shops do not have that luxury. When we opened up the spindle the source of the noise was immediately evident. The bearing lubrication had become contaminated and the bearings were starting to deteriorate. Sometimes customers wait a little too long to take a spindle out of service. 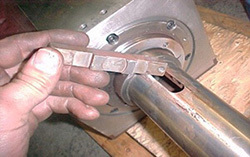 The bearing cage can fail causing the bearing to seize up. This can result in expensive journal damage.